Simple yet stunning, this modern day build captures the spirit of Medieval swords from the past. The handsome 30 in. blade is doubled sided and accented by a partial center blood groove. Matching stainless steel guard and pommel are contrasted by the black leather wrapped handle. A leather scabbard with brass tip is included, complete with belt loop for ease of carry. This sword measures 36 1/2 in. overall. Scabbard is rough looking but thick leather covered with some oil. Tip is stainless and matches the sword. Fit is slightly tight. Blade is good looking covered in grease with no rust. Blade has slighest wave in edge and the two edges are a bit asymetrical bit still pretty straight for a 50$ blade. Most surprising was that when I placed the tip on the floor and bent the blade 10-15 degrees it actually sprang back. Edge is thick and rounded. Gaurd and pommel are brushed stainless,attractive but not flashy. Handle is wood with a tightly sewn leather wrap. It is all screwed together with your basic rattail tang. After seeing the spring in the blade I decided to I wanted to sharpen this sword. The blade is so thick and heavy this will require a grinder or a lot of file work. I've spent a lot of time with a grinder so thats what I did. After grinding filing sanding I was soon slicing bottles with the best of them. For a final test I chopped a 1 1/4 inch limb off of a fig tree. No form I just whacked at it letting the blade slap flat a few times to see if it could handle the abuse. The blade held up very well but did twist in its fittings. I had to add a washer to the assembly to get some extra tightness. This sword is really front heavy, good looking in a ruggeded way, and with some work can be a light to medium cutter. Lot of bang for your buck. 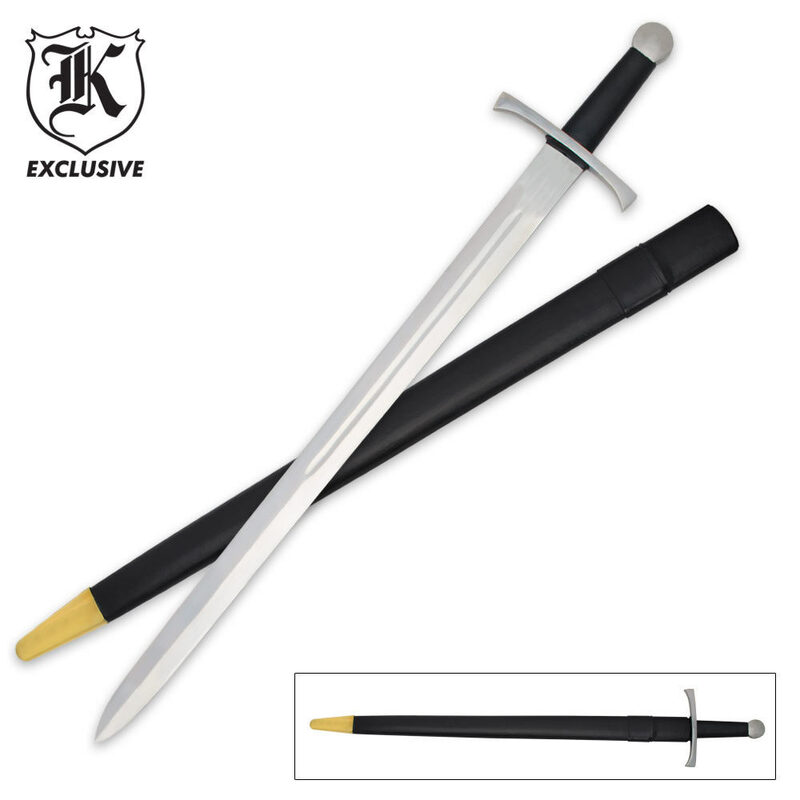 This sword is very pretty; and would make quite a wallhanger but that's about it. Came with no edge, the pommel is way too small and the balance is so poor you might as well be swinging a sledgehammer. The leatherwork is terrible, the leather quality is trash, and it's all screwed together, loosely at that. I haven't taken it apart because I might sell it; however, I'd bet money that its got a rat tang. You could probably make a fairly decent sword out of it if you had access to some tools. you'd have to add weight to the pommel and give the blade an edge and a better fuller, as the fuller was barely existent. The sheath barely fits the sword, it requires notable force to remove it or replace it, and the sheath itself was banged up. The shipping was awful, and the box was beat to hell on arrival, with holes included. the guard on the sword was long on one side and short on the other, as well as very wobbly. it was made in Pakistan; or at least, according to the poor etching job on the blade it was. I can't say much as to the metallurgy, although it does seem to be at least somewhat quality steel. Might be carbon; however, I highly doubt it. All in all, pretty sword; however, a piece of garbage and you'd be better off buying something else. If you want a sword to carry and wield this sword is balanced much better than the more decorative swords. I'm buying this for a knights costume and didn't want a real blade heavy sword. Its simple buy could easily be used in combat without much muscle. True knights sword.